Premium mobile spray rigs feature a polyurethane foam spraying machine with a mobile transport system, with a portable box truck or trailer. Mobile spray rigs are the current standard for foam contractors, as they are convenient and practical to take from job site to job site. These mobile spray foam rigs include all the SPF tools and components necessary for an efficient and productive spray foam job: air and power utilities, spray machine, spray guns, material drums, a compressor and all the tools you need. Rigs save time during a spray foam job setup, as you don’t need to find somewhere to hook up your equipment every day. Everything you need is in one convenient place. Trailer mobile polyurea spray rigs are the most popular and common setup, for a reason: they are practical, do not require a special driver’s license, and they can be customized to your specific needs. Trailer spray foam rigs come in sizes ranging from 12 to 24 feet, sometimes longer. They only require a standard pickup truck to haul them. The size of your trailer is determined by your power and material needs. The higher output and material amounts, the bigger the trailer should be to accommodate more drums and generators. For heavy duty or very large jobs, contractors will sometimes use a gooseneck trailer. However, gooseneck trailers require a 3/4-ton truck to pull. Drivers need a special commercial license for this type of truck, so consider the costs of hiring a driver or training your current staff before investing in a gooseneck premium spray foam rig. The great benefit of trailer systems is that they are commonly sourced and budget-friendly. They can be hooked up to any compatible pickup truck (unless you choose a gooseneck), which makes it easy to carry around with the fleet you probably already have. Also, you can use the external walls of your trailer for marketing purposes: you can display your logo, slogan and contact information. Larger companies and those hired for large, high output commercial and industrial projects might want to consider a box truck system. This premium mobile spray foam rig is a whole truck (including the cab) with everything you need in the container area. The box truck is especially useful for carrying two proportioning machines, which means that you can do double the work in the same amount of time. You can also carry more material drums and, obviously, more power generators for all that spray foam equipment. Box truck systems are more expensive but are worth the investment if you are involved in large-scale projects or need to work under tight deadlines. 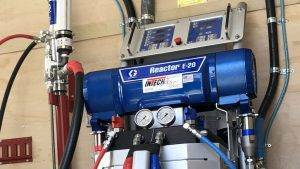 Recent technology advancements have made it possible to combine the proportioner, generator and air compressor into one integrated unit, reducing the overall space needed for the spray foam rig. Obviously, this compact size comes at some cost for power and output but is perfect if you do smaller jobs on a regular basis. Their smaller size and weight means lower gas costs for your truck fleet, and less space needed to store and operate the rig. A smart contractor could buy several compact units to work on many job sites at the same time, which can increase your range, client base, and profitability for each job. When you make a decision about the best type of polyurea spray rig to purchase, you need to keep a few things in mind. First, does the rig allow you to carry enough material for the job? If you run out of spray foam halfway through your day, it will cost you time and money to go back to your business or spray foam provider for more product. Look at the average size of your jobs and consider a premium spray foam rig that allows you to carry at least that much material. Next, do you have experienced and licensed drivers for gooseneck or box truck rigs? For gooseneck and some box truck rigs, you will need a driver with a commercial truck driving license. A regular driver’s license is fine for a pickup truck with a trailer but will not do for bigger vehicles. Consider the added cost of hiring properly licensed employees or drivers for that purpose before choosing a specialized rig. Finally, you must also think about whether you want to be tied to a specific foam provider. At Intech Equipment, we only provide premium custom rigs. Since we don’t sell foam, you are free to get your sprayfoam materials from any provider you choose. Our customer service includes best-in-class technical and part sales and troubleshooting expertise. Contact us today for all your sprayfoam rigs and equipment needs.